Philadelphia Phillies outfielder Jose Bautista walks back to the bench after striking out during the seventh inning. The Phillies might be in a bit of trouble heading into the final month of the MLB season. Losers of eight of their last 10, the Phils are now 4.5 games behind the Braves for the division lead and 2.5 games out of the second National League wild card spot. It's gotten so bad for Gabe Kapler's team that not even Cy Young candidate Aaron Nola could stop the bleeding on Tuesday night, as the Phils found a new way to lose to the Nationals and are now at risk of being swept out by their division rivals before playing host to the Cubs over the holiday weekend. And if the Phillies can't win that series against Chicago, it'll mark one month since they won at series — tithe Phillies swept Miami in a four-game series from Aug. 2-5. Luckily, it'll be the last-place Marlins up next for Philly after the Cubs. 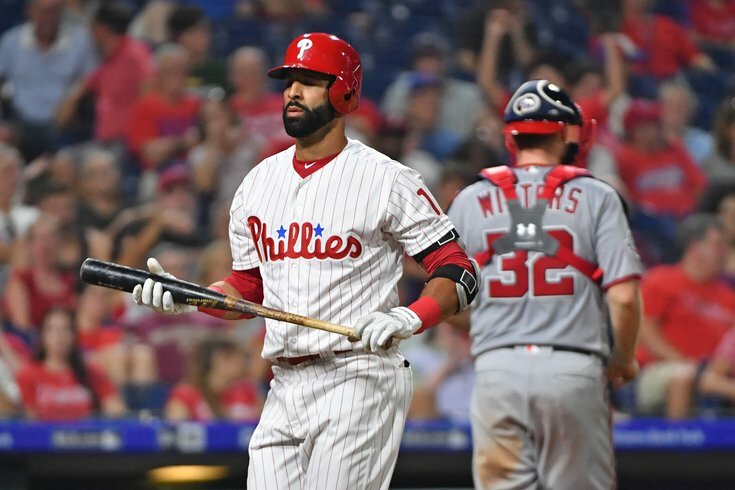 Recently acquired slugger Jose Bautista will make his first start for the Phillies on Wednesday night as Jake Arrieta tries to do what Nola couldn't: put an end to this losing streak. Needless to say, the recent losses have been reflected in MLB power rankings nationally, as the Phillies find themselves outside the top 10 across the board. Mike Oz 12 (-2) Have we told you the NL playoff picture is madness lately? You’re right. We droned on about it last week too. These four continue to jostle for position — even the Braves and D-backs are in that group. The Dodgers, after a dive deeper into the standings, have won four in a row and are trying to get past the equally up-and-down Rockies. Both the Phillies and Brewers are trying to rebound from similarly up-and-down Augusts. Gabe Lacques 11 (-3) Braves beware: Phillies, 41-22 at Citizens Bank Park, play 15 of next 21 at home. Matt Snyder 11 (-3) A 2-4 week against the Nationals and Blue Jays after losing three of five to the Mets. That's not hitting their stride at the right time. Joel Reuter 14 (-1) An 11-12 month that includes a 2-6 stretch heading into play Monday has sent the Philadelphia Phillies from a half-game up in the NL East standings to three games behind the rival Braves. The bullpen has shown significant cracks in recent weeks, and the offense has gone cold to the tune of a .712 OPS in August that ranks 22nd in the majors. They still have seven games remaining against the Braves, including a three-game series in Philadelphia to close the season, but they need to turn things around quickly.